What do you do when the dead body you stumble across belongs to your father, the father you thought abandoned you in infancy? That’s what Timmie Campbell asks herself. Turns out her mother has been lying for years: about her father’s abandonment … about a lot of other things. Unfortunately, Timmie can’t dwell on her mother’s dishonesty because she has to deal with the stalker who’s monitoring her every move outside her mountain home in western Montana. And the additional bodies that begin piling up. 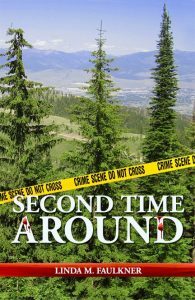 Sheriff’s deputy Jack Kendall further complicates Timmie’s life. He’s investigating the multiple murders and is equally intent on resuming their relationship—the one he ended the previous summer. Unfortunately for Jack, Timmie’s not the least bit interested in romance. Her priority is stopping the killer before he wipes out her family. Linda extends heartfelt thanks to Steph Lambert of Missoula, Montana for designing the wonderful cover. This book was published under the name, Linda M. Faulkner.